lt;stronggt;CWNFL3610GYlt;/stronggt;lt;BR/gt;Crown Ribbed Anti-Fatigue Matlt;BR/gt;Are you and your workers on your feet for extended periods The cushiony surface on these mats offers the comfort you need. Heavy design is able to withstand an industrial working environment. 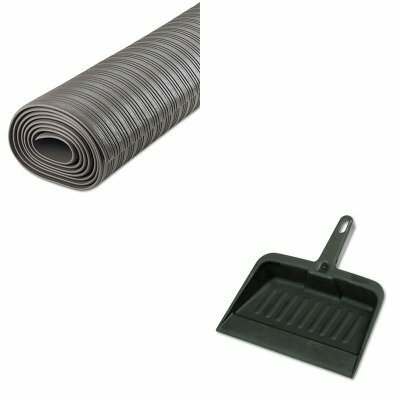 Mat Type: Anti-Fatigue Mat Application: Indoor Materials: Vinyl.lt;BR/gt;lt;BR/gt;lt;stronggt;RCP2005CHAlt;/stronggt;lt;BR/gt;Crown Ribbed Anti-Fatigue Matlt;BR/gt;Handy dustpan features a tapered front edge to help simplify sweeping-up. Heavy-duty, moderately flexible plastic provides commercial-grade durability. Lanyard handle-hole allows you to hang and store the pan out of the way. Material(s): Polypropylene; Width: 8 1/4quot;. ~ Includes one dustpan.